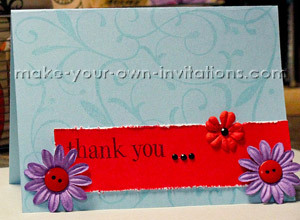 Stamping your cards is a very effective and cheap method of producing a lot of quality thank you note cards quickly. You will readily find a rubber stamp with the text 'Thank You' from almost any crafting store or Craft section in your local department store. If you have good hand writing and don't mind the extra labour you could save money buying the stamp and write the message yourself. Score your card at 4" lengthwise and fold it in half. Alternatively you can purchase patterned paper and adhere it to the front or you can simply leave it unadorned. card slightly below half way and flush with the right hand side of the card. Place flowers randomly on to the card. Use glue dots to attach the gems and buttons to the centre of the flowers.